Kinohimitsu J'pan StemCell Drink is the most innovative anti-ageing drink that helps you to look younger and feel fantastic! 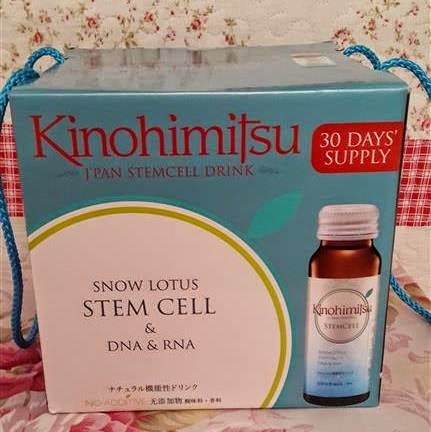 Kinohimitsu J'pan StemCell Drink contains patented Snow Lotus Stem Cell, DNA, RNA and other active ingredients to rejuvenate and re-energise every cells in our body. With Kinohimitsu J'pan StemCell Drink, ageing can be delayed and quality life can be prolonged naturally! High quality and excellent ingredientSnow Lotus Stem Cells are cultured at the state-of-the-art biotechnology to retain its high quality and pureness; and obtain long lasting results. Comprehensive formulaThe active ingredients work together to form a bodyguard-like matrix to protect the cells from free radicals. No additives100% natural and safe, no sugar added, no preservatives, no artificial colouring or flavouring. Hormones, steroids and chemical free tested by SGS (Global Benchmark Recognisation on Quality and Integrity). EffectiveLiquid formula enables immediate absorption by the body. ConvenienceA functional, instant drink ready for immediate consumption and enjoyment anytime, anywhere.